Employees of PCT Federal Credit Union gather to congratulate Joseph Nash. PCT Federal Credit Union is pleased to announce that they have awarded Wareham High School student, Joseph Nash, a sponsorship to fully fund his competition expenses for the 2015 Distributive Education Club of America (DECA) International Career Development Conference (ICDC). The credit union has had the pleasure of employing Joe since June of 2014. Joe has worked as a part-time teller but has also offered his knowledge in other areas of operation. Most recently, he has made valuable contributions to the creation of the new Youth Accounts program. Throughout his employment at PCT Federal Credit Union, Joe has developed as an employee and an individual. 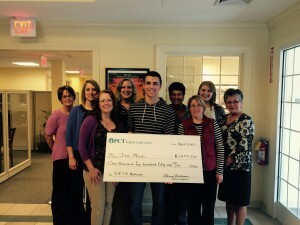 The credit union recognizes the Wareham High School DECA program for helping to prepare young individuals, such as Joe, for professional work cultures. Joe recently competed at the state competition for DECA in the Personal Financial Literacy category; a category that had sparked his interest due to his employment at the credit union. He placed 1st in his category at the state competition and is now qualified to compete at the national level in Orlando, Florida at the end of April. PCT Federal Credit Union is happy to sponsor Joe’s competition expenses in full to grant the opportunity of a lifetime to a young individual. 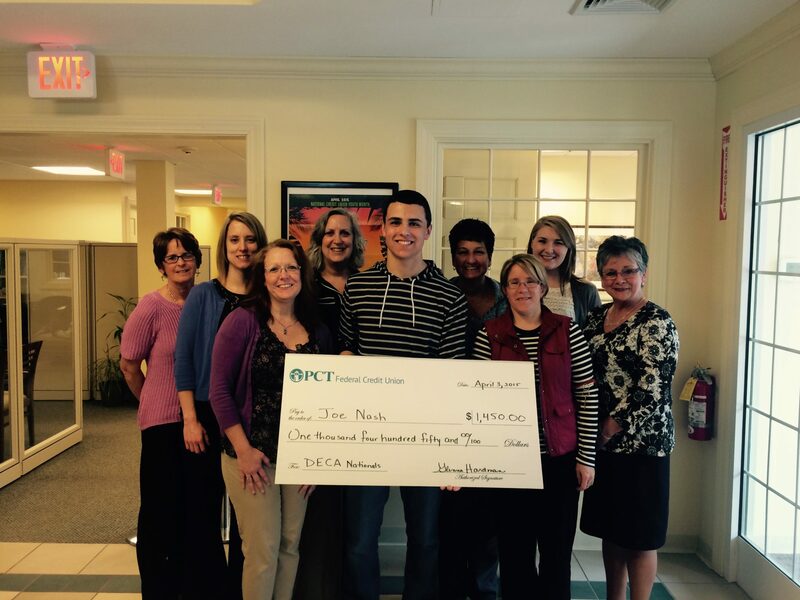 With the help of Cindy Sylvia, Wareham High School DECA Advisor, and Joe’s family, the credit union surprised him with the sponsorship check on April 3rd. “PCT Federal Credit Union took a shot on a Wareham High School sophomore and created a win-win relationship” said Sylvia at the event. The credit union has had the honor of employing a young man with a promising future and Joe has been able to gain real life experience he can turn around and apply in the classroom.